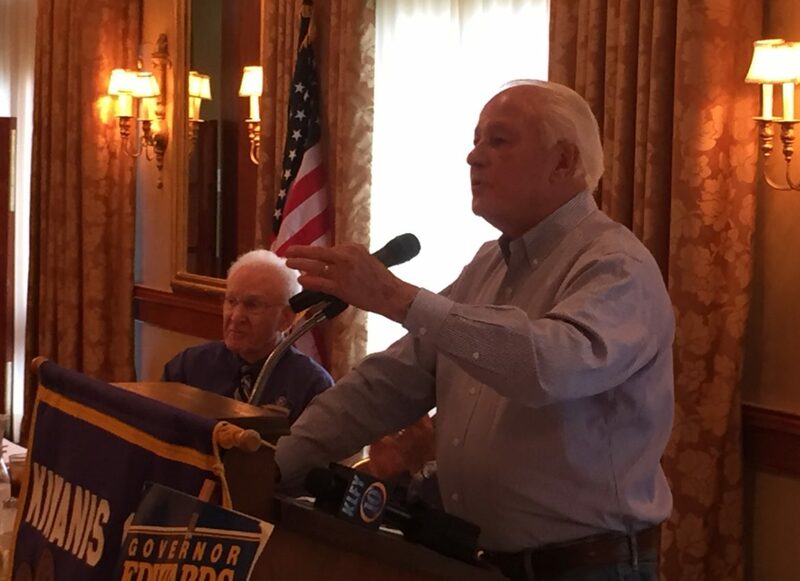 Kiwanis of Lafayette, thanks former Governor Edwin Edwards for speaking to us today. Governor Edwards first spoke of his fondness of Lafayette and of the mission of Kiwanis and that, as a father of a four year old, the needs of children are never far from his thoughts. Most of his discussion, he commented on a variety of current events and provided his opinions with his trademark wit. He predicted that the oil industry, which is showing signs of recovery, will see the price of oil rise above $70 a barrel before the year’s end. He enumerated the factors which lead to his belief, including the proposals made by the Trump administration. Edwards next discussed the ongoing Syrian crisis and remarked that he agreed with Trump’s position of non-involvement as a candidate, but he also believed that Trump’s military response to the chemical attack was also right. He went on to remark that the past presidential election was only the third time in his life that he voted Republican. He also took questions from our members and our many guests and again responded to the requests with great humor. Thanks again to Governor Edwin Edwards for visiting with us today!